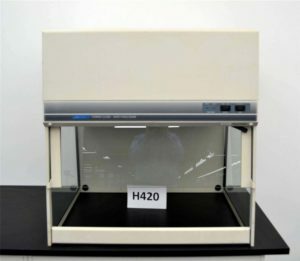 Fume hoods and Biosafety Cabinets are specialized types of laboratory equipment. They both look similar and they both protect lab personnel from hazards. But differences exist when it comes to their purpose, function, and operation. Fume hoods protect users from hazardous chemicals and volatile vapors by moving air away from the work area. The ventilated enclosures draw air away from the laboratory worker at the face of the equipment. This evacuation of air continues across the work surface and through the ductwork where the contaminated air is released into the atmosphere. Biosafety cabinets take solid materials out of the airstream by protecting the user, the environment, and the material. 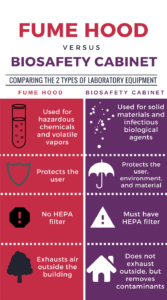 One major difference from a chemical fume hood is that biosafety cabinets have high-efficiency particulate air (HEPA) filters. These filters will trap all known infectious agents and ensure that only microbe-free exhaust air is discharged back into the laboratory. These filters, however, do not remove gas vapors from the air that is filtered. Biosafety cabinets actually disburse gases back into the laboratory. In summary, fume hoods take air and contaminants away from the user. In doing so they dilute the air to control gases. Biosafety cabinets, on the other hand, clean particles out of the laboratory air and remove airborne contaminants inside of the hood. 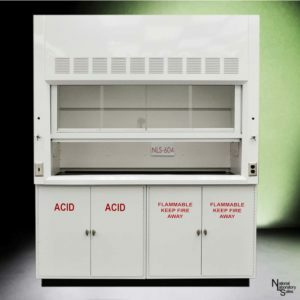 National Laboratory Sales has the right fume hood or biosafety cabinet for your laboratory. Along with a full line of new and used laboratory casework, we are a one-stop experience for high-quality products and provide quick shipment on everything we sell. Contact National Laboratory Sales today!